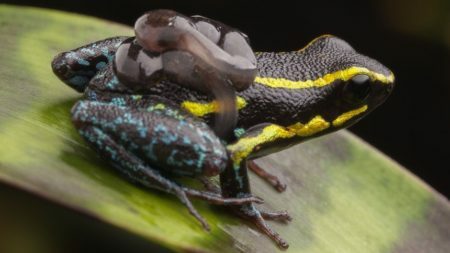 For most pet lovers, reptile and amphibian husbandry are primarily a means of climate control and proper diet. A small range of temperature and humidity levels should be maintained to keep your pet happy and healthy. For adjusting the temperature, lights and heaters are used. Humidity, on the other hand, isn’t quite as simple. You’ll need to mist the cage manually or rely on automated devices like misters or foggers. An ‘ultrasonic humidifying fogger’ is a device used to increase humidity in a terrarium by use of water vapor, also known as ‘fog’. 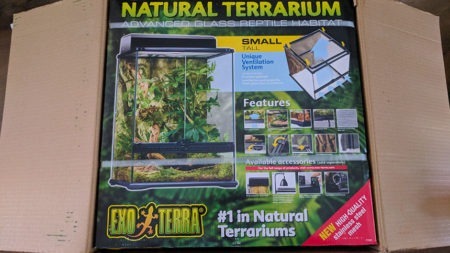 That’s what this page is all about; which products are the best foggers for terrariums. Fog machines are ideal for species that require a high humidity and they’re a great alternative to mist. Most importantly, they do most of the work for you. Simply fill the tank with water, adjust the output, and watch the fogger blow cool water vapor into your pet’s terrarium, raising the humidity. Of course, the visual appeal is not to be ignored either; it’s undoubtedly one of the selling points. Foggers, also known as atomizers, are generally different from misting systems because they produce a different size of water droplets. Misting systems are capable of producing water droplets up to 200 microns in size, which quickly falls to the bottom of the enclosure. But fogging systems produces droplets around 10 microns which are suspended in the air until it evaporates. High-pressure fogging systems produce water droplets that are 10 to 20 times smaller than an average mister. The following products are among the best foggers on the market today. But they’re far from equal. While their fog output is relatively similar, the devices are quite different; in size and durability. The most important aspect comes down to ease-of-use and how long it lasts before it quits working altogether. I’ve spent countless hours researching this topic. My goal is to present you with the best options, save you time, and hopefully keep you from wasting your hard-earned money. So, without further delay, here are my most recommended terrarium foggers. Perhaps the best fogger on the market today. Well worth the money, easy to use, and very durable. 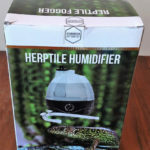 The reptile fogger from Evergreen Pet Supplies is a slice of simplicity. It’s easy to refill, comes with a lengthy hose, complete with suction cups, and most important of all, it rarely stops working after a few months like some of its competitors. To read more about this product, read the full review below. The trusted Zoo Med brand is back with another great product. This one is ranked #2 due to a few common problems and the size of the tank. 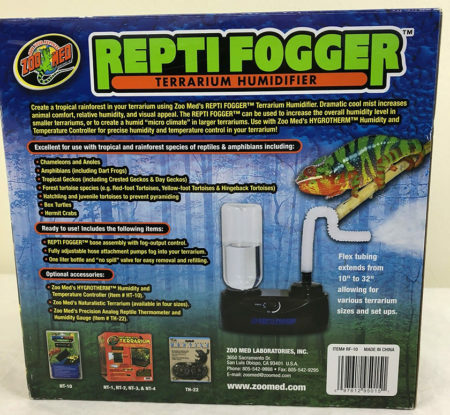 The ReptiFogger from Zoo Med is an all-around great fogger. It does, however, have one common problem that remains to be fixed by the time of writing this review. Aside from that, it’s worth a shot if you’re not able to get your hands on our #1 recommended fogger. Read the full review below. The newest atomizer on the list, this fogger is moderately priced but lacks sufficient testing time. This spot originally belonged to another fogger. I wrote the entire review but decided to change it last minute due to its poor quality. That and, well, I just happened to stumble across this new device. I haven’t had a chance to test it but neither has anyone else, from what I understand. Read the full review and everything I could find out about this product in the section below. I’ve taken the liberty of reviewing the top foggers on the market. While they’re not the only systems available, they are certainly among the best. Between these 3 foggers, one stands out as the best and the reason might surprise you. 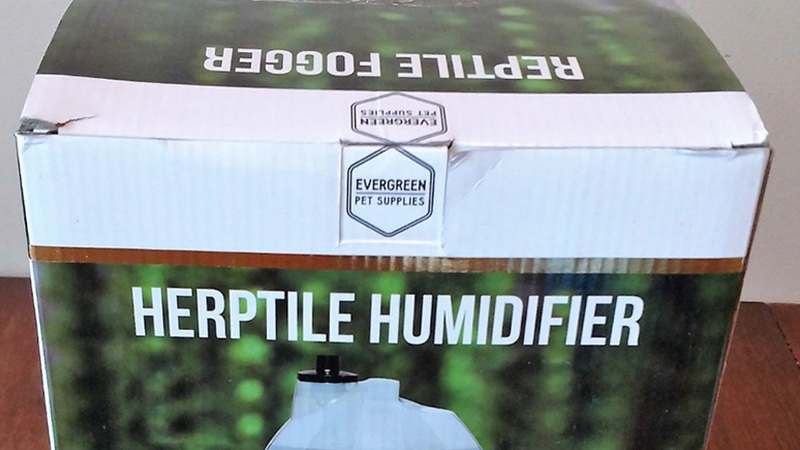 The Evergreen Pet Supplies Reptile Fogger. The tank can hold up to 2 liters of water and has a no-spill valve for easy filling. It’s easy to set up and has a longer lifespan if handled according to the instructions in the kit. It also features an adjustable hose that extends from 1.5 to 5 feet and comes complete with suction cups to keep the hose in the desired position. As mentioned previously, you can adjust the density of the fog from low to heavy, using the dial on the front. Depending on this setting, the water will last anywhere between 7 hours to 4 or 5 days. Seven hours is roughly the time it takes this machine to atomize 67 oz (2 liters) of water on full blast. Since you probably won’t be doing that, you can likely expect to refill the tank every other day. With every top 3 reviews, I like to give my reasoning on why I picked the #1 product over the other two. So here goes, the Evergreen Pet Supplies Reptile Fogger has a genius, spill-proof design with an adjustable 5 ft hose, complete with suction cups. It holds a decent amount of water and most important of all; it usually lasts more than a few months. Two or more similar products have bad reputations for breaking after a few short months. This fogger, fortunately, doesn’t have that reputation. The Zoo Med Repti Fogger. 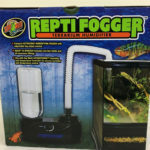 The Repti Fogger from Zoo Med is another great product. It comes complete with an adjustable fog output control system, 3 feet of hose, and a one-liter bottle for storing the water. It’s a very clever design, featuring a no-spill valve for easy refilling. It has a safety shut off feature to stop the system from running when the water level is too low. One downside and common problem for the Repti Fogger comes from its rheostat; the part that controls the fog output. The safety shut-off float sometimes sends reports of the water level being too low which results in the fogger stopping, even when there is plenty of water in the tank. This issue is few-and-far-between. 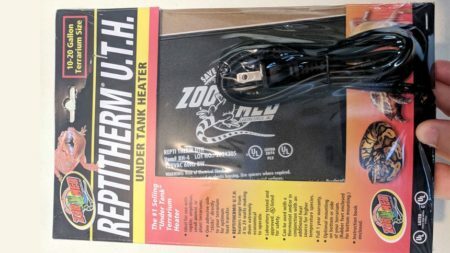 The biggest downside of the Repti Fogger is its durability. More than a few customers report having to replace this atomizer several times per year. Not everyone, mind you. But enough I felt it’s worth mentioning. Should you decide to purchase this fogger, look for a return policy that will allow you to exchange it within 90 days. The 2.2L Reptile & Amphibian Fogger. By specs alone, this fogger is nothing to scoff at. With an hourly output of 250 mL per hour and decently-sized 2.2-liter tank, this device is definitely an up-and-comer. The hose comes with suction cups, which is nice for mounting the hose where you want it. Perhaps the only thing this product is lacking in is reviews. This atomizer is new and I haven’t tested it, but neither has anyone else; at least not from what I can find at the time of writing this post. I’ll do my best to update this review in the coming months. 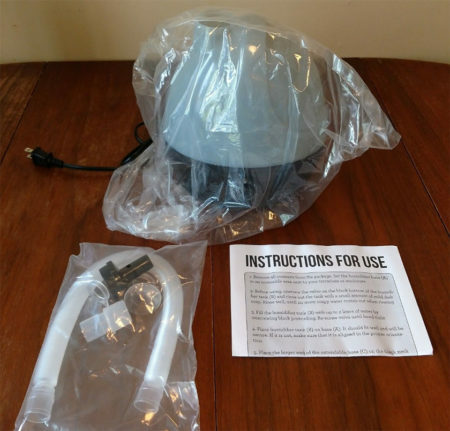 Since you’re considering the purchase of a fogger for your terrarium, I felt it appropriate to share a few tips for using these devices. 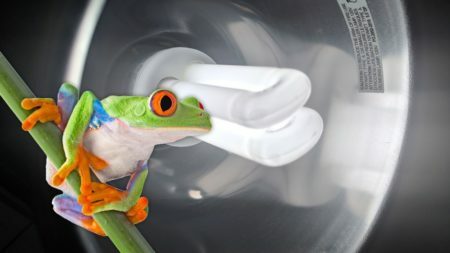 Use Distilled Water – Amphibians prefer water to be toxin-free water with natural minerals and a balanced pH level. Distilled water is certainly clean, free from all toxins and chemicals. The only downside is that it lacks natural minerals. 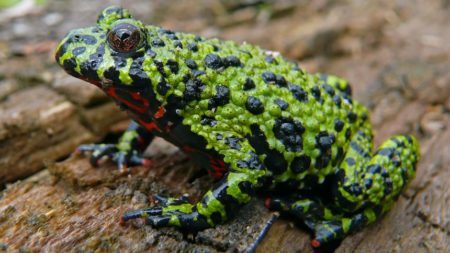 If you want to learn more about this topic, check out my safe water guide for amphibians. 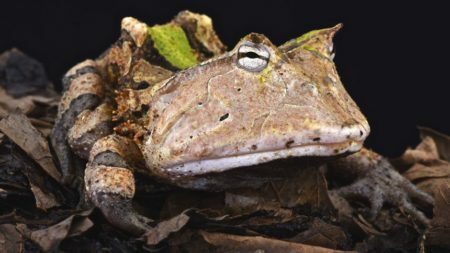 However, being as the fog is not the main source of water for your frog, it’s perfectly fine to use distilled water in foggers and misters. Using distilled water is recommended because there is no calcium in it. If you’re using tap-water high in calcium, it’s going to build up over time and probably result in your atomizer breaking. Automate the Fogger with a Hydrotherm – Through the use of a humidity controller, you can automate the fogger to turn on when the relative humidity drops below a certain percentage and shut off after the humidity is raised. The Inkbird AC 110V can also regulate an exhaust fan to blow air out of your terrarium if the humidity gets too high. Create a Drip Loop – For safety purposes, always create a ‘drip loop’ to keep water from reaching the outlet. 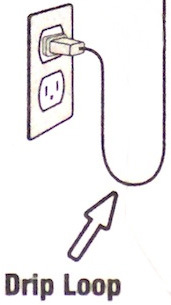 This is achieved by allowing the power cord to hang, in a “U” shape, just below the power outlet. If water happens to run down the cord, it will stop and the bottom and fall down. Please refer to the illustration below. To prevent water from reaching the power outlet. I hope this guide has helped you in selecting the fogger that works best for you. If you found this page useful, please consider sharing with your family and friends.